Is cast an option in the treatment of thoracolumbar vertebral fractures? Background: Thoracolumbar vertebral fractures are common in high-energy trauma and often are associated to other concomitant injuries. Currently, brace and Closed Reduction and Casting (CRC) are the two conservative treatments proposed by literature. Despite CRC was widely used in the past, today brace is preferred. The aim of our study is to evaluate clinical and radiographic outcomes of thoracolumbar type A fractures, not associated with other injuries, treated with CRC. Materials and Methods: We retrospectively evaluated all patients treated from 2008 to 2015, with a mean age of 26.69 years (range 15–45). All patients were affected by AO type A fracture: 26 type A1, 17 type A2, and 21 type A3. All patients were evaluated by X-ray, computed tomography, and magnetic resonance imaging. Radiological evaluations included vertebral kyphosis (VK), segmental kyphosis (SK), regional kyphosis (RK) angle, and vertebral ratio (VR) measures. Patients were clinically assessed through visual analog scale, Oswestry Disability Index, Roland–Morris Disability Questionnaire, and Short Form 36 Health Survey. Results: Seventy-four patients (41 males and 33 females) were included in the study. At follow-up (mean 28.48 months ± 5.16), we found significant improvements in VK (P = 0.000013), SK (P = 0.000455), and RK (P = 0.000016). No significant differences were observed in VR (P = 0.26). Good clinical results were reported in patients in all scores and 90.7% of patients returned to work. Conclusions: Closed reduction and casting is still a reliable treatment option in selected thoracolumbar fractures without spinal cord involvement. A correct fracture evaluation, patient compliance, and motivation are essentials. Several treatments for type A fracture were proposed, especially in patients without neurologic impairments. Both surgical and conservative treatments are described in literature with good results.,, Conservative treatments comprehend bed rest, physiotherapy, spinal braces, and closed reduction associated to casting (CRC); however, in literature, there is no evidence about a better conservative treatment. It is proved that nonsurgical strategies are not inferior to surgical ones about their cost-effectiveness. Nowadays, there is a consensus that posttraumatic kyphosis may cause chronic low back pain probably derived from soft tissue surrounding the spinal deformity and biomechanical changings in neighboring spinal segments.,, According to the consensus, closed reduction and casting technique described by Boehler in his book in 1951 seems to be actual. This technique allows the reduction of fractures segments thanks to ligamentotaxis and casting can guarantee segments contentions till healing. The purpose of our retrospective study is to evaluate middle-long-term clinical and radiographic results of selected thoracolumbar type A fractures, treated with closed reduction and casting. Minimum of 2-year follow-up (FU). For every patient, the diagnosis was made after evaluation of X-rays, computed tomography scans, and MRI. Treatment consisted in closed fracture reduction on the Bell frame. This system uses ligamentotaxis derived by positioning the patient in physiological lordosis to obtain vertebral fracture reduction. No anesthesia was used during the procedure. When reduction was obtained, the patient was kept on the frame and a plaster cast was fabricated. Patients were recovered in our spine surgery department for few days after procedure. During the hospital stay, patients were clinically controlled, especially for pain and eventual cast syndrome. Weight-bearing was not permitted for 40 days after procedure, and only bed rest was allowed. Parents and caregivers were instructed to log roll procedures for the right patient's management for hygiene and mobilization after the hospital discharge. The patient X-ray examinations were conducted after CRC, at 40–60–90 days, 6 months, and 1 year after trauma. Other radiological evaluations were made every year during the FU. After the first radiological evaluation at 40 days, the cast was removed and Jewett orthosis was prescribed to every patient till 90 days from trauma with a progressive weight-bearing. All patients underwent deep vein thrombosis (DVT) prophylaxis with low molecular weight heparin. 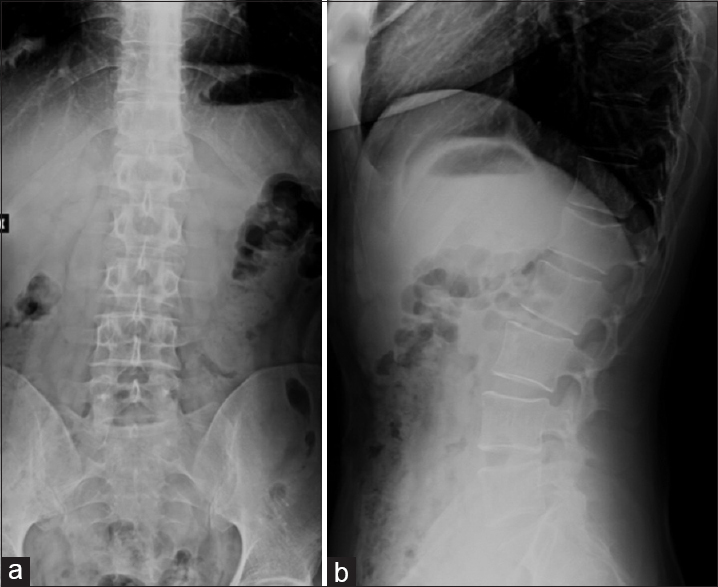 Vertebral kyphosis (VK), segmental kyphosis (SK), and regional kyphosis angle (RK) were calculated on X-ray. The ratio between posterior and anterior vertebral body called vertebral ratio (VR) was also calculated. Delta score was calculated as the difference between kyphosis (VK, SK, and RK) and VR at the time of trauma and at FU. Clinical evaluations were made with visual analog scale (VAS) scale, Oswestry Disability Index (ODI),, Roland-Morris Disability Questionnaire (RMQ), and Short Form 36 Health Survey (SF36). Time of hospitalization and time of return to work were also recorded. Two different operators, not involved in the study, performed radiological and clinical evaluation with the same radiological program (Synapse-Fujifilm). Mean value of the two calibrations was taken as valuable. Clinical scores and radiological measures were reported as mean ± standard deviation (SD). 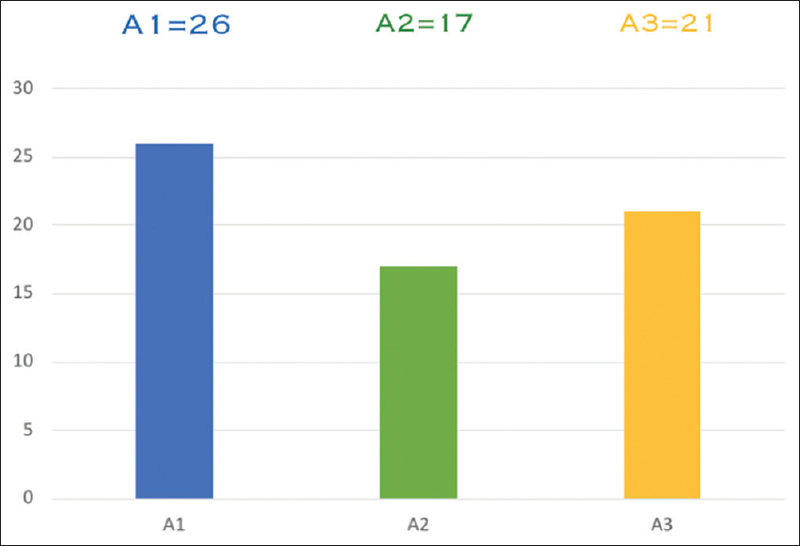 Student's t-test was used to assess differences using SPSS software (IBM, Bologna, Italy) statistical. Level of significance was set at P < 0.05. Seventy-four patients were included in the study; 41 males (55.4%) and 33 females (44.6%). The most common causes of trauma were road traffic accidents, resulting in 31 cases (42%), of those 5 (16%) patients were pedestrians. Falls were the second cause of fractures (28 cases, 38%), followed by sport-related trauma (15 cases, 20%). Two patients (2.70%) requested cast removal during the first days after the procedure for intolerance and 8 patients (10.8%) were lost at FU. The final study population was composed by 64 patients, 39 males (61%) and 25 females (39%). Patients were aged from 15 to 45 years old (mean age 26.69 years ± 6.32). We collected 26 (40.6%) type A1, 17 (26.6%) type A2, and 21 (32.8%) type A3 vertebral fractures [Figure 1]. Twelve (18.75%) fractures affected T12, 42 (65.63%) affected L1, and 10 (15.62%) affected L2. FU ranged from 24 to 48 months (mean 28.48 months ± 5.16). TLICS of patients included in the study ranged from 1 to 2. Demographic data were reported in [Table 1]. Results of VK, SK, RK, and VR are reported in [Table 2]. We can appreciate a mean improvement in all parameters. VK, SK, RK, and VR delta score were −3.69°Cobb ± 4.24°, −2.87°Cobb ± 3.08°, −3.87°Cobb ± 6.05°, and −0.17 ± 0.3, respectively. A significant improvement of deformity in VK (P = 0.000013), SK (P = 0.000455), and RK (P = 0.000016). No significant differences were observed for VR (P = 0.26) [Figure 2], [Figure 3], [Figure 4] and [Table 2]. Mental health 82.4 ± 15.66. We reported no DVT, decubitus, urinary tract infection, or other complications during the treatment. At the time of trauma, 43 (67.2%) patients were employed. Thirty-seven (86%) of employed patients returned to work at 6 months after trauma. At FU, 39 (90.7%) of them returned to work and 3 (6.9%) had to change their task with one with less physical involvement, while only 1 (2.3%) was still unemployed at FU. Radiographic examination revealed that the treatment we proposed can reach an excellent control of kyphosis deformity at 2-year FU. From the trauma time to CRC confectioning, VK, SK, and RK mean values reduced of 3.5°, 4°, and 6.99° Cobb, respectively. These results remained stable at FU and the delta score could explain better the radiographic results, as reported in [Table 2], while VR can explain mathematically the restoring of body height thank to reduction. VR was maintained till the FU with a height gain of 12.3%. A lot of treatments were proposed for thoracolumbar fractures,,,,,,, and the best treatment must be chosen taking in consideration: AO fractures classification, fracture dislocation, neurological status, patients' comorbidities, and compliance. There are several authors supporting conservative treatment with reduction, as well as those reporting excellent results with fracture reduction and stabilization.,,, Cochrane collaboration in a recent work of Abudou et al., defined contradictory and insufficient the evidence found in literature to define which one between surgical and nonsurgical treatment yields superior results, as already reported by van der Roer et al. In literature, many studies observed an association between kyphotic deformity and low back pain after treatment.,, Loss of correction seems to be the first complication of CRC and probably one of the main causes of recurrent back pain after vertebral fractures. Good reduction of kyphosis after CRC was reported by Tropiano et al., Wood et al., and Weninger et al. ; they observed very good kyphosis reduction but a loss of correction at FU., The authors found a VK loss of 65%–90% and an RK loss of 86.4%–111%. In our study, we did not have cases of loss of reduction; a possible explanation could be related to our protocol. Weight-bearing was forbidden till the callus formation (40 days approximately). It is known that 80% of stresses pass through the anterior column of the spine, so we believe that weight-bearing during before the complete callus formation could displace the reduced fragments and promote kyphosis development. After this period, the reduction could be considered stable; cast could be removed and then replaced with a Jewett orthosis till complete bone healing. This protocol, to the best of our knowledge, differs from other described in literature. We are aware that 1 month of complete bed resting may drive patients to some medical complications such as DVT and decubitus, cast syndrome, and urinary tract infection; otherwise, in our series, we have not observed them. However, it must be noted that patients included in our study are young, with good general status and no severe comorbidities. Regarding pain and function-related outcomes, our findings suggest that CRC is a valuable choice. Our VAS (1.36) is comparable to that of Wood et al. and Bagga et al., ODI, SF-36, and RMQ are similar to those reported in literature.,, Comparing our results with the current literature, we can appreciate that CRC has no inferior performances in clinical results than other conservative treatment protocols, but it is important to underline a better control of deformity in medium-long FU. Finally, our study took into consideration the return to work of patients. Wood et al. and Gnanenthiran et al., demonstrated, in long-term FU studies, that nonsurgically-treated patients were more engaged in full-time occupation when compared to surgically treated ones. Our results are in keeping with these authors confirming that our protocol can be feasible even for hard workers. 91% of our patients returned to their original work at FU, while 4 out of 43 patients (employed at the moment of trauma) did not return to their original working task and only 1 was not employed at the FU. Eighteen patients were hard workers and only 3 had to change their working task with one less engaging. Several limitations to our study must be acknowledged. First of all, the number of patients was limited. We were not able to contact all patients treated, so we have lost at FU approximately 11% of them. The low number of patients, the retrospective nature of our analysis, and the lack of a control group, may influence the study results. Closed reduction and cast treatment should be considered a reliable option as treatment in selected thoracolumbar fractures without spinal cord involvement. A correct fracture evaluation, patient compliance, and motivation are essential in the choice of this kind of treatment. Talic A, Kapetanovic J, Dizdar A. Effects of conservative treatment for osteoporotic thoracolumbal spine fractures. Mater Sociomed 2012;24:16-20. Vaccaro AR, Oner C, Kepler CK, Dvorak M, Schnake K, Bellabarba C, et al. AOSpine thoracolumbar spine injury classification system: Fracture description, neurological status, and key modifiers. Spine (Phila Pa 1976) 2013;38:2028-37. Kraemer WJ, Schemitsch EH, Lever J, McBroom RJ, McKee MD, Waddell JP, et al. Functional outcome of thoracolumbar burst fractures without neurological deficit. J Orthop Trauma 1996;10:541-4. Denis F. The three column spine and its significance in the classification of acute thoracolumbar spinal injuries. Spine (Phila Pa 1976) 1983;8:817-31. Girardo M, Rava A, Fusini F, Gargiulo G, Coniglio A, Cinnella P, et al. Different pedicle osteosynthesis for thoracolumbar vertebral fractures in elderly patients. Eur Spine J 2018;27:198-205. Girardo M, Cinnella P, Gargiulo G, Viglierchio P, Rava A, Aleotti S, et al. Surgical treatment of osteoporotic thoraco-lumbar compressive fractures: The use of pedicle screw with augmentation PMMA. Eur Spine J 2017;26:546-51. Bagga RS, Goregaonkar AB, Dahapute AA, Muni SR, Gokhale S, Manghwani J, et al. Functional and radiological outcomes of thoracolumbar traumatic spine fractures managed conservatively according to thoracolumbar injury severity score. J Craniovertebr Junction Spine 2017;8:369-73. Bakhsheshian J, Dahdaleh NS, Fakurnejad S, Scheer JK, Smith ZA. Evidence-based management of traumatic thoracolumbar burst fractures: A systematic review of nonoperative management. Neurosurg Focus 2014;37:E1. Aras EL, Bunger C, Hansen ES, Søgaard R. Cost-effectiveness of surgical versus conservative treatment for thoracolumbar burst fractures. Spine (Phila Pa 1976) 2016;41:337-43. Vaccaro AR, Silber JS. Post-traumatic spinal deformity. Spine (Phila Pa 1976) 2001;26:S111-8. Oda I, Cunningham BW, Buckley RA, Goebel MJ, Haggerty CJ, Orbegoso CM, et al. Does spinal kyphotic deformity influence the biomechanical characteristics of the adjacent motion segments? An in vivo animal model. Spine (Phila Pa 1976) 1999;24:2139-46. Siebenga J, Leferink VJ, Segers MJ, Elzinga MJ, Bakker FC, Haarman HJ, et al. Treatment of traumatic thoracolumbar spine fractures: A multicenter prospective randomized study of operative versus nonsurgical treatment. Spine (Phila Pa 1976) 2006;31:2881-90. Böhler L. Die Technik der Knochenbruchbehandlung. Wien: Aufl. Maudrich; 1957. p. 12-3. Sprague J. Cast syndrome: The superior mesenteric artery syndrome. Orthop Nurs 1998;17:12-5. Ulmar B, Brunner A, Gühring M, Schmälzle T, Weise K, Badke A, et al. Inter- and intraobserver reliability of the vertebral, local and segmental kyphosis in 120 traumatic lumbar and thoracic burst fractures: Evaluation in lateral X-rays and sagittal computed tomographies. Eur Spine J 2010;19:558-66. Fairbank JC, Pynsent PB. The oswestry disability index. Spine (Phila Pa 1976) 2000;25:2940-52. Guclu DG, Guclu O, Ozaner A, Senormanci O, Konkan R. The relationship between disability, quality of life and fear-avoidance beliefs in patients with chronic low back pain. Turk Neurosurg 2012;22:724-31. Bedbrook GM. Treatment of thoracolumbar dislocation and fractures with paraplegia. Clinical Orthopaedics and Related Research 1975;112:27-43. Denis F, Armstrong GW, Searls K, Matta L. Acute thoracolumbar burst fractures in the absence of neurologic deficit. A comparison between operative and nonoperative treatment. Clinical Orthopaedics and Related Research 1984;189:142-9. Stadhouder A, Buskens E, Vergroesen DA, Fidler MW, de Nies F, Oner FC, et al. Nonoperative treatment of thoracic and lumbar spine fractures: A prospective randomized study of different treatment options. J Orthop Trauma 2009;23:588-94. Abudou M, Chen X, Kong X, Wu T. Surgical versus non-surgical treatment for thoracolumbar burst fractures without neurological deficit. Cochrane Database Syst Rev 2013;6:CD005079. van der Roer N, de Lange ES, Bakker FC, de Vet HC, van Tulder MW. Management of traumatic thoracolumbar fractures: A systematic review of the literature. Eur Spine J 2005;14:527-34. Farcy JP, Weidenbaum M, Glassman SD. Sagittal index in management of thoracolumbar burst fractures. Spine (Phila Pa 1976) 1990;15:958-65. Domenicucci M, Preite R, Ramieri A, Ciappetta P, Delfini R, Romanini L, et al. 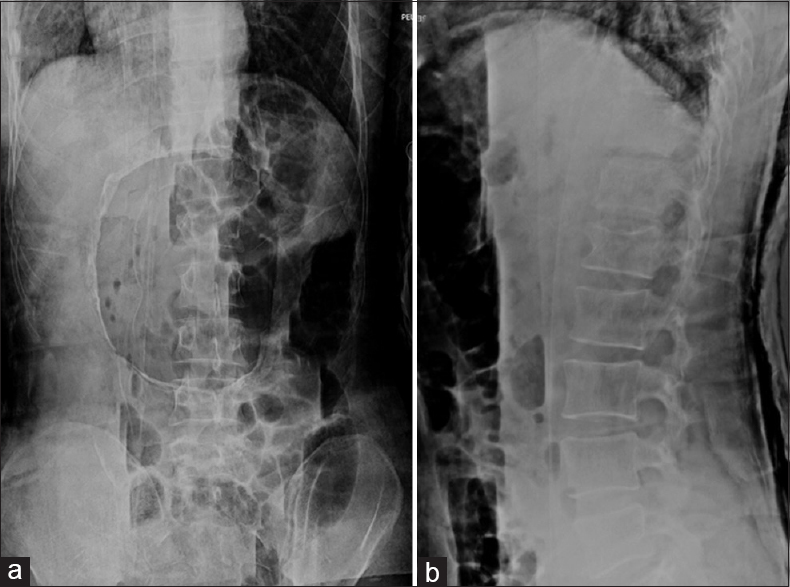 Thoracolumbar fractures without neurosurgical involvement: Surgical or conservative treatment? J Neurosurg Sci 1996;40:1-10. Oner FC, van Gils AP, Faber JA, Dhert WJ, Verbout AJ. 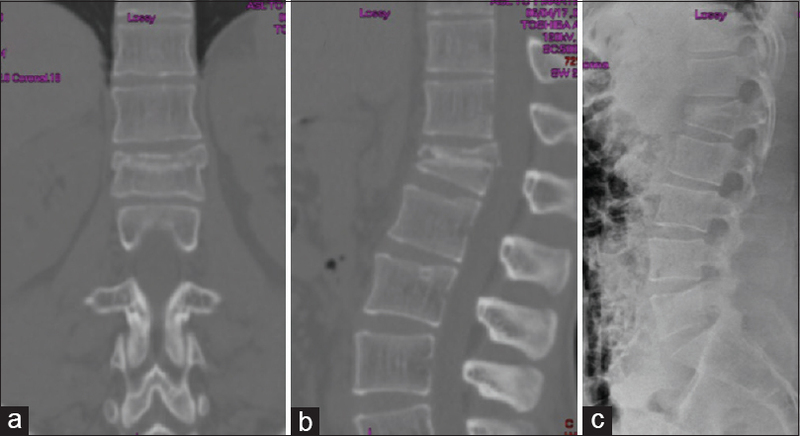 Some complications of common treatment schemes of thoracolumbar spine fractures can be predicted with magnetic resonance imaging: Prospective study of 53 patients with 71 fractures. Spine (Phila Pa 1976) 2002;27:629-36. Tropiano P, Huang RC, Louis CA, Poitout DG, Louis RP. Functional and radiographic outcome of thoracolumbar and lumbar burst fractures managed by closed orthopaedic reduction and casting. Spine (Phila Pa 1976) 2003;28:2459-65. Wood KB, Buttermann GR, Phukan R, Harrod CC, Mehbod A, Shannon B, et al. Operative compared with nonoperative treatment of a thoracolumbar burst fracture without neurological deficit: A prospective randomized study with follow-up at sixteen to twenty-two years. J Bone Joint Surg Am 2015;97:3-9. Weninger P, Schultz A, Hertz H. Conservative management of thoracolumbar and lumbar spine compression and burst fractures: Functional and radiographic outcomes in 136 cases treated by closed reduction and casting. Arch Orthop Trauma Surg 2009;129:207-19. Gnanenthiran SR, Adie S, Harris IA. Nonoperative versus operative treatment for thoracolumbar burst fractures without neurologic deficit: A meta-analysis. Clin Orthop Relat Res 2012;470:567-77.